The Sevenoaks U3A Cycle group (also open to other U3As), meets twice a month and normally rides 25 to 30 miles in the local area. But for our annual “outing” we are a little more ambitious. This year we did a three day trip to Norfolk, where two of the days were about 50 miles - so some of us had to get in some training! We did not get off to a good start in Norwich. In the space of the first 20 minutes we (a) got completely lost and (b) one of our members hit a post and sustained minor injuries. He did however quickly recover when given appropriate massage by two members of the group, one of whom is a nurse and the other an osteopath! Things could only get better and they did. We soon got out of the urban area and onto Marriott’s Way, a cycle route which uses the old railway track. We had coffee at a former station near Reepham which has been extensively restored and now used as a Railway Museum. After lunch at Fakenham we passed the old Second World War RAF station at Docking, and then on to a seaside hotel in Hunstanton for the night and good meal in a local restaurant. 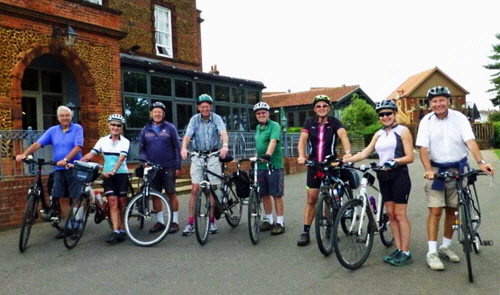 The following day we headed east, did a tour of the magnificent grounds of Holkham Hall (seat of the Earls of Leicester), and then on to the sea wall beside the river coming into Wells-next-the-Sea. We had lunch at Stiffkey and arrived in Cromer for the night, passing another stately home, Felbrigg Hall, on the way. A magnificent sunrise drew some of us out for an early morning swim before the final half day ride back to Norwich Throughout the trip we only used very minor country roads which were delightful, and the weather was very kind to us. A great trip. If you are interested in joining the group please contact Patrick Pascall on 01732 452602. This shared Group has been running for about six years and is made up of 6 members. One of our players is now unable to make all the meetings and we would be delighted if we could recruit one or two new members. 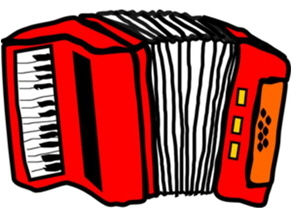 The problem is that it is such an unusual instrument that it is not easy to learn from scratch so we are really looking for people who have some experience with the instrument and can read music. We are a fairly jolly little group and we all enjoy playing our repertoire of music and we also play the occasional public performances. We meet on alternate Mondays for two hours. Study Groups which rely on equipment for the day-today running of the group may apply for a grant. These come in 2 forms, a Start-up Grant of up to £75, or a Capital Grant of up to £100 for a group that has been running for 2 years or more, and also requires some additional equipment. The hardware belongs to the U3A and is returned if the Group should disband. It belongs to the whole group and not to an individual, and should be something which cannot be borrowed, e.g. from the Public Library. If this applies to your group, please contact the Group Co-ordinator for a form. Vacancies in various Groups come and go throughout the year. If there is a Group that you are interested in joining, please see the contact details for the Group Organiser in the relevant section of this website or in the Handbook. 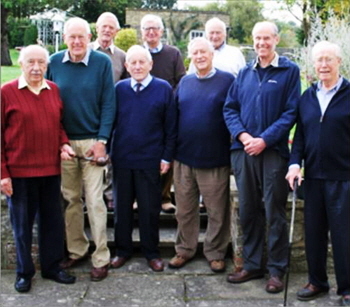 Military History, originally The First World War Group, is one of the longest running groups in Sevenoaks U3A. The first meeting, in November 1997, had six members. That quickly rose to our ‘living room maximum’ of twelve and has stayed at around that number ever since with a small turnover. Currently we are all male although there have been lady members. Many of our members have served in the Forces, which has contributed to the cohesiveness we have always enjoyed, but the Group has never developed into old soldiers’ reminiscences. The lady members who joined had family military connexions. Our first Group Leader, Brian Tolmie, had an encyclopaedic knowledge of the First World War and we looked not only at the war in France/Belgium but also in Italy, East Africa and the Middle East. We looked not only at battles and campaigns, but also at associated topics like underground warfare (before Birdsong), and women’s contributions. After 5 years we extended our range and the group’s title changed. Since 2002 we have ranged from the Trojan Wars through Agincourt to the epic story of a lone bomber flying to the Falklands. Presentations are individually and eclectically chosen, some with more history and others more military, but most with a balance of the two. Discussion is encouraged, during and after a presentation. We always leave feeling something has been learnt and memories jogged. Two of our members have recently left due to ill health which has created vacancies. Any member interested in joining the group should contact the group organiser, Nick White. Members of the group are expected to give an hour long presentation on a topic of their choice once a year. Sevenoaks is full of live music, with the Symphony Orchestra, the Philharmonic Society, and the Music Club offering a wide range of orchestral, choral and chamber music respectively. And then there are the other events such as the Great Comp Festival and the numerous jazz and blues events, some linked with the Sevenoaks Festival. To help members get more from their concert-going or home listening, there are two Music Appreciation groups in our U3A taking classical music as their theme. (There are also an Opera group and two Jazz and Blues groups - how’s that for choice? Group B meets in members’s homes on the fourth Monday afternoon (2-4 pm), to listen to recorded programmes prepared by members or run on a “pick and mixâ” basis. We contribute what we can, whether we know a lot or a little. We don’t claim to be experts but we always enjoy listening and exploring music and sharing our tastes. .
For an informal chat about what how we work and some typical programme themes, contact Jeff Lee (Group Organiser for Group B) by email at musicb@sevenoaksu3a.org.uk . And don’t forget to come along to the Open Afternoon on Wednesday 26th September. Our Group embraces a much wider area of interest than just military battles. As we have evolved we have recognised that the background to conflict has much wider consequences which embrace factors such as Politics, Sociology, Economics and Technology and this leads to a wider view of the effects of conflict and how it shapes the world in which we live. Our future program will address the Baltic states, the Roman Navy, the Welfare State, âœThe Doughboysâ - US contribution to WW1, the Fall of Singapore and the Korean War. We have vacancies for two members to join our committee where we plan the ongoing programme of talks. Ideally, we would like to invite two ladies to join us as we like to maintain a balance of views for our ongoing science programme. Experience in science is not essential, it is more important to be enthusiastic and have good organisational skills. In 2010 Knole and Sevenoaks U3As drew up an agreement to set up shared groups. The agreement has worked well and we believe that we should continue to collaborate, wherever there is mutual benefit. Group Organisers who wish to offer spaces in groups which meet the above criteria should continue to contact Susan Henson Groupdev@Sevenoaksu3a.org.uk first and she will discuss the proposal with Knole. These arrangements only apply to Sevenoaks and Knole members. In time we may need to set up similar agreements with other local U3As and these will be assessed on a case by case basis depending on their membership status.